The Conservation Education Intern is a member of the Conservation Education Team within the broader San Luis Obispo Operations Team. The intern will actively engage the local community through outreach events, education opportunities, festivals and fairs, and interaction with the public on the beach during stranded marine mammal response. The intern will learn and convey information on The Marine Mammal Center’s global conservation mission and local activities that support this mission, with the goal of inspiring our audiences to become ocean stewards and supporters of The Marine Mammal Center. The intern will work with the Conservation Education Team to brainstorm and plan outreach and education events. There may be limited opportunities if interested and as needed to learn and assist in marine mammal rescue and care, however the focus of the position is conservation education. The position will collaborate with other staff, interns and student programs at the Morro Bay facility, as well as team members across the Center’s range. The intern will be supported and supervised by the San Luis Obispo Operations Assistant and the Operations Manager. The Conservation Education Internship is an unpaid position based in Morro Bay, CA. Active participation in tabling at festivals and fairs. Active participation in education events at schools, student camps, etc. in the local community. Active participation in speaking events/presentations to local community groups. As opportunities are available, serve as the communications officer on stranded marine mammal responses, engaging with the public to explain our activities and mission. 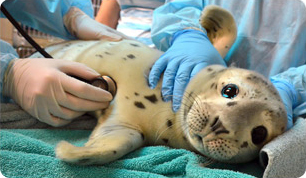 Potential for “seal-sitting” – conducting outreach and education at the site of a resting non-stranded or on watch marine mammal, particularly elephant seal weaners and harbor seal pups, to help explain to the public how they can help keep the animal safe. Work with Conservation Education Team to brainstorm and plan events. Depending on the candidate and duration of the internship, develop skill to lead and organize above mentioned conservation education events. If interested and as needed, potential to assist in basic marine mammal rescue and care (limited percentage of internship time). Background and/or experience in public speaking and/or education with diverse audiences. Ability to stand or walk for up to 4 hours. Comfortable spending several hours on an open beach area environment. Ability to lift and move up to 30 pounds, and comfortable walking on uneven terrain such as sand and rocky beaches. Ability to remain calm and collected in stressful situations. Ability to work professionally and politely with all, including volunteers and staff of all ages and backgrounds, and diverse public audiences. Able to complete tasks in a productive, proactive manner. 21 years or older as of January 13, 2019. Pass a background and motor vehicle check. Attend mandatory training on Sunday, January 13. Please note this internship is an unpaid volunteer position. The internship will begin on Sunday, January 13 last 3 to 6 months with flexible end dates and extensions available for excellent candidates. The intern must be available to start on Sunday, January 13 for the Center’s winter orientation in Morro Bay. The weekly time commitment will range from 12-24 hours per week, based on the selected candidate’s interest and availability. The ideal candidate will have at least one weekend day open for flexible scheduling. To apply, click the link below. The deadline to apply for the Spring 2019 Conservation Education Internship at San Luis Obispo Operations is Monday, November 19, or until the position is filled.